"And you know what they call a Quarter Pounder with Cheese in Paris?" One of the challenges of living in a multi-cloud world is understanding all the little differences among them. 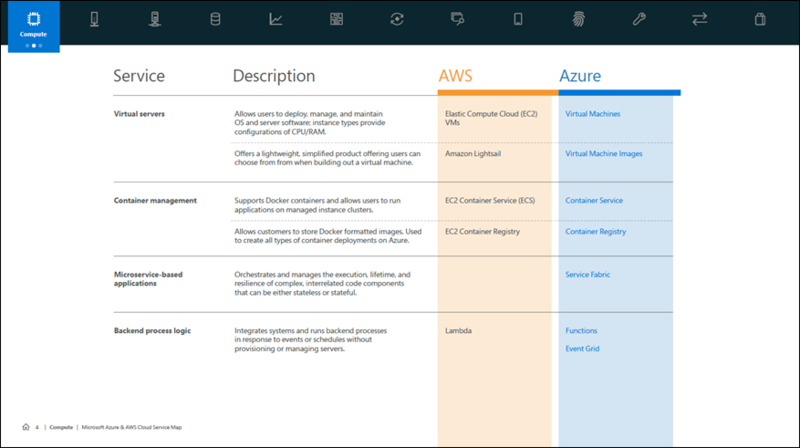 Last week we published the Cloud Service Map for AWS and Azure, which will help you identify the equivalent services in one cloud when you know what it's called in the other. Of course, there are some services you'll only find in one or the other for which there is no equivalent at this time. Download a PDF of the Cloud Service Map for AWS and Azure. To learn more, see: Cloud Service Map for AWS and Azure Available Now. Last week, Microsoft's cloud chief, Scott Guthrie, toured Chicago, Dallas, Atlanta, Boston, and New York City to write code live and demonstrate how Azure can help you solve some of your most complex developer problems. We live-streamed the full five hours of his final show in New York for online audiences and captured it for on-demand viewing. On the Microsoft Developer site, you can find a list of the demos that Scott did on the tour along with links to help you locate them in the documentation. Azure offers a comprehensive set of compliance offerings to help you comply with national, regional, and industry-specific requirements governing the collection and use of individuals’ data. Our government customers are responsible for the most sensitive data and the most critical applications in the country. Azure Government is the mission-critical cloud, providing more than 7,000 Federal, State, and local customers the exclusivity, highest compliance and security, hybrid flexibility, and commercial-grade innovation they need to better meet citizen expectations. Introducing Azure Government Secret - multi-tenant cloud infrastructure and cloud capabilities to U.S. Federal Civilian, Department of Defense, Intelligence Community, and U.S. Government partners working within Secret enclaves. Blockchain for Azure Government - support for a wide array of our Azure blockchain and distributed ledger marketplace solutions, which automate the deployment and configuration of blockchain infrastructure across multiple organizations, allowing our customers to focus on government transformation and application development. Unified security management with Azure Security Center - a unified security management and advanced threat protection for hybrid cloud workloads, enabling government agencies to take on evolving security threats. Expanding High Performance Computing in Azure Government - Azure H-series virtual machines, with InfiniBand and Linux RDMA technology, are designed to deliver cutting-edge performance for complex engineering and scientific workloads such as weather prediction and climate modeling, trajectory modeling, and other memory-intensive projects. New Virtual Desktop Infrastructure options in the cloud - extend existing Citrix environments and deploy Windows 10 desktops into Azure Government from Citrix Cloud. To learn more, see: Announcing new Azure Government capabilities for classified mission-critical workloads. Azure Service Bus and Azure Event Hubs Geo-disaster recovery - Azure Service Bus and Azure Event Hubs just released a preview of an upcoming generally available Geo-disaster recovery feature. Azure Data Factory v2: visual monitoring added - easily monitor Azure Data Factory v2 pipelines without writing a single line of code. Azure Cosmos DB in Azure Storage Explorer - explore and manage Azure Cosmos DB databases with the same consistent user experiences that make Azure Storage Explorer a powerful developer tool for managing Azure storage. Hybrid Storage with Azure File Sync - Klaas Langhout joins Scott Hanselman on Azure Friday to show Azure File Sync for centralizing file services into Azure, which reduces the cost and complexity of managing islands of data while preserving existing app compatibility and performance. In addition, it provides multi-site access to the same data, tiering of less frequently used data off-premise, and integrated backup and rapid restoration. Azure API Management: New UI & Mocks - Anton Babadjanov joins Scott Hanselman on Azure Friday to discuss the new redesigned administrative UI for API Management. Also, see how it enables a design-first approach with the ability to produce simulated (mocked) API responses. The Azure Podcast: SQL on Linux - Bob Ward, Principal Architect on the SQL Server Team, talks about the release of SQL Server on Linux, which is available in Azure and on-premises. Cloud Tech 10 - AWS Cloud Service Map, Bing Custom Search, Cosmos DB and more!